Strength: 350 mg THC.. STRONG!! Taste: This fudge brownie with a marshmallow, chocolate, and nut topping is adventurous! Each bite is extremely flavorful. Considering the strength of the brownie, we expected it to have more cannabis taste than it did! This brownie is soooo delicious it can be easy to eat too much! Packaging: Enjoyable Edibles has a distinct packaging. The label says 4 doses which we believe could be too much for certain users. We appreciate the nutritional information listed on the back! 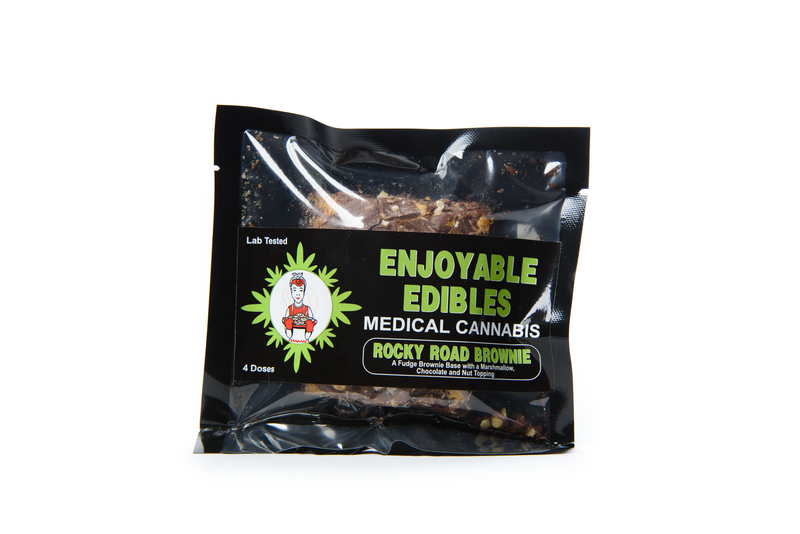 Overall: We love this Rocky Road Brownie by Enjoyable Edibles! At 350 mg THC per brownie, this thing is STRONG! New users should use extreme caution when eating this brownie. Experienced users should start with a fourth of the brownie before eating any more. The high this brownie induces is a heavy relaxed high. The mix of flavors in this brownie is quite a treat! We love the mix of chocolate, marshmallow, and nuts. Give this brownie a try if you want to be heavily medicated!